It was great to Bastien Tardieu, son of the Michel who founded Tardieu-Laurent back in 1994, in town for a relaxed dinner at Daphne’s in South Kensington recently. Especially so as he needed to leave again to over see the vineyards at the crack of dawn the next morning. You can get the full Tardieu-Laurent background info but essentially the business is a Negociant-Eleveur that only deals in old vine parcels from the best blocks. The aging is then reductive with only topping up, they work/have worked with 80-100 different producers some for as long as 8-10 years now. We started the evening with the Cotes du Rhone Blanc “Guy Louis” 2011 as an aperitif, this wine is a hommage to both of Bastien’s great grandfathers – Guy & Louis – it has fruit from a few communes but is essentially a declassified Crozes-Hermitage Blanc. The wine is very young but has great balance the weight of fruit and structure is all from the fruit with no new oak used at all, nice way to start. We then moved onto a pair of whites with the Tuna Tartare. Condrieu 2011 was the first one and I have to say I share Bastien’s thoughts on “not being a fan of Viognier except in Condrieu”. This wine sees 12 months in barrel with 30% of that being new oak. The wine went down well. I like the slight oaking as it adds a touch of smokiness and balances the extravagant fruit you get from the variety. There was a lovely freshness but also richness, the fruit being somewhere between lychee and dry-pineapple. I enjoyed it and would drink it over the next 1-3 years the style worked well alongside the very different next white Hermitage Blanc 2010. This was really great, a serious wine that, showed well but clearly has masses to give in the future. We were already in potential “wine of the night” territory (not that it’s a competition). The sort of white to decant and then wallow in. There was one great fact from Bastien on this and that it that originally Hermitage was 100% white and now it is only 15%. This wine was a taut, tight but rich wine with minerality in spades, and a dry honey and Greek yoghurt fruit character ever so classy. A flight of Southern Rhone reds was up next with the Lamb. Starting with Gigondas VV 2010 this was atypical in its seriousness for Gigondas, it was classically proportioned and savoury, with dry black fruits, a wine that is in need of time to flourish and expand. The raw components are all there to leave it for a while and come back to a gem. We then had two different vintages of Chateauneuf-du-Pape VV the 2009 and 2001. The wine sees 24 months in barrel of which none is new. The plot from which this comes is in one of the top spots – La Crau. The 2009 was the only wine on the night that, to me, didn’t quite give its showing. The fruit was a bit bruised and whilst there’s a lot of it there there was a little bit of balance missing. Might just be me or the bottle or most likely the moment. What a contrast to the 2001 from magnum, this was terrific, lovely forceful elegance, delicious. This has an age to go but if I owned it I would be starting, slowly, now. Just what the commune is all about. 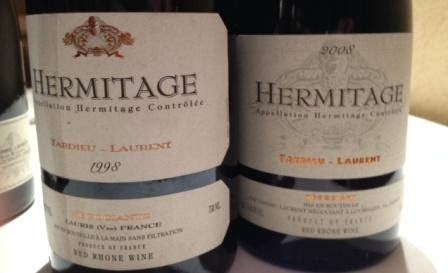 The final pair of the evening with Mushrooms on toast was Hermitage 2008 and 1998. In a way the 2008 was the star…just so good for the vintage, pure elegant and not overly big (something slightly Piedmontesque about it!!). The explanation may come from the fact that the plot the wine came from was the very last harvested even after Mr Chave’s. I feel like I’ve been rude about the 1998 by association when really it was a marvel. With lovely, getting mature character, a savoury sweetness that was so moreish. And off to bed for Bastien! Cracking wines.